Plants have evolved highly complex systems of defense against most of their natural enemies (eg, insects, animals). At the very least, these defenses make many plants unpalatable; however, some can be fatal to the inexperienced forager. Resins represent one form of plant defense. See the image below. 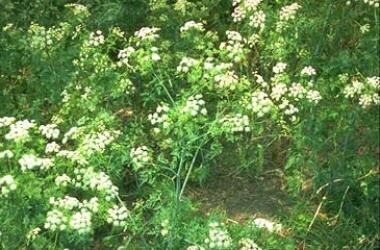 Hemlock. Photo by Cornell University Poisonous Plants Informational Database. Throughout human history, plants have played pivotal roles as medicines and poisons. Our medical predecessors may not have known the exact mechanisms involved, but they did recognize various plants as instrumental for medical treatment and as instruments of murder. With current technology, we finally are able to peer into plants and see their vast arsenal of chemicals, including glycosides, alkaloids, oxalates, and resins. When considering poisoning by plant resin, always be aware of possible co-intoxicants, which may blur the clinical picture. Such co-intoxicants include pharmaceutical and illicit drugs, herbicides, fungicides, insecticides, fertilizers, and artificial plant hormones. See 11 Common Plants That Can Cause Dangerous Poisonings, a Critical Images slideshow, to help identify plant reactions and poisonings. For patient education information, see the First Aid and Injuries Center, as well as Poisoning and Activated Charcoal. Resins are a diverse group of chemical compounds that share chemical characteristics, such as insolubility in water, solidity at room temperature, and lack of a nitrogen group. Resin compounds formed with sugars are called glycoresins; those formed with oils are called oleoresins. Latex is a term used to describe these toxins when found in emulsions (ie, urushiols, which are catechol derivatives)  in ducts of plants. They are released and activated when structural damage to the plant occurs. While some individuals ingest toxic plants to attempt suicide, most present to the emergency department after unintentional toxic plant ingestion. Martínez Monseny A, Martínez Sánchez L, Margarit Soler A, Trenchs Sainz de la Maza V, Luaces Cubells C. [Poisonous plants: An ongoing problem]. An Pediatr (Barc). 2015 May. 82 (5):347-53. [Medline]. Diaz JH. Poisoning by Herbs and Plants: Rapid Toxidromic Classification and Diagnosis. Wilderness Environ Med. 2016 Mar. 27 (1):136-52. [Medline]. [Full Text]. Aziz M, Sturtevant D, Winston J, Collakova E, Jelesko JG, Chapman KD. MALDI-MS Imaging of Urushiols in Poison Ivy Stem. Molecules. 2017 Apr 29. 22 (5):[Medline]. Curtis G, Lewis AC. Treatment of severe poison ivy: a randomized, controlled trial of long versus short course oral prednisone. J Clin Med Res. 2014 Dec. 6 (6):429-34. [Medline]. Hafsi W, Badri T. Erythema, Multiforme. 2018 Jan. [Medline]. [Full Text]. Daphne. Photo by Cornell University Poisonous Plants Informational Database. Poison ivy. Photo by Cornell University Poisonous Plants Informational Database. Poison ivy. Photo from the Centers for Disease Control and Prevention. Poison oak. Photo by Cornell University Poisonous Plants Informational Database. Poison sumac. Photo by Cornell University Poisonous Plants Informational Database. Poison ivy rash. This photograph shows an individual's arm with a blistering poison ivy rash. Hardin Library for the Health Sciences, University of Iowa Public Domain Picture (http://www.lib.uiowa.edu/haRDIN/MD/cdc/4483.html) and Centers for Disease Control and Prevention. Poison oak rash. This photograph depicts an individual's arm with a blistering poison oak rash. Note the linear pattern to the lesions. Hardin Library for the Health Sciences, University of Iowa Public Domain Picture (http://www.lib.uiowa.edu/haRDIN/MD/cdc/4484.html) and Centers for Disease Control and Prevention.